I was raised to believe that motorcycles are an accumulation of parts. My father, a racer in every sense of the word, has built countless examples of them. He pushed every last one to their limits and, on a bad day at the track, crashed them, all without forming an emotional connection with a single one. They were parts. And easily replaceable ones at that. These four motorcycles vary in terms of specification but are similar in their ability to bring a smile to your face. What my father didn’t realize is that motorcycles can be more than that. They can be the things that light a fire inside of you—that make even the simplest commute seem special. Certain motor­cycles can stir your soul in such a way that you miss them every moment you’re not out riding them. And smile when you are. 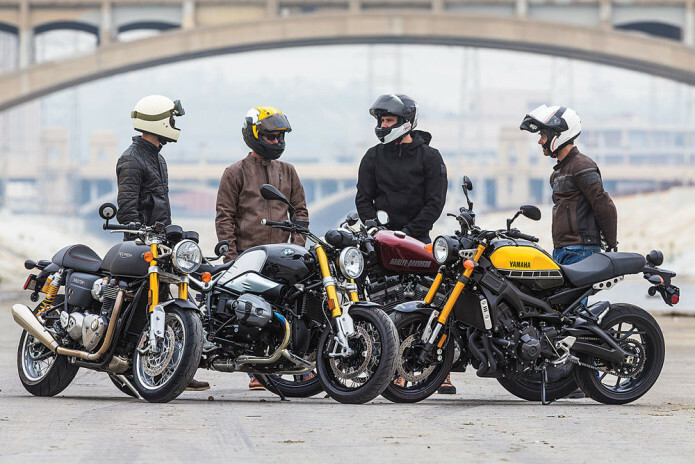 That, to us, is what heritage-inspired bikes like the BMW R nineT, Harley-DavidsonRoadster, Triumph Thruxton R, and Yamaha XSR900 are.